As Christian teachers, we want to do more than just inspire our students to love academics. We also want to make a real and lasting impact in their hearts and lives. We strive to help them grow in character and wisdom and experience the greatest joy when we see Christ work directly in their hearts. 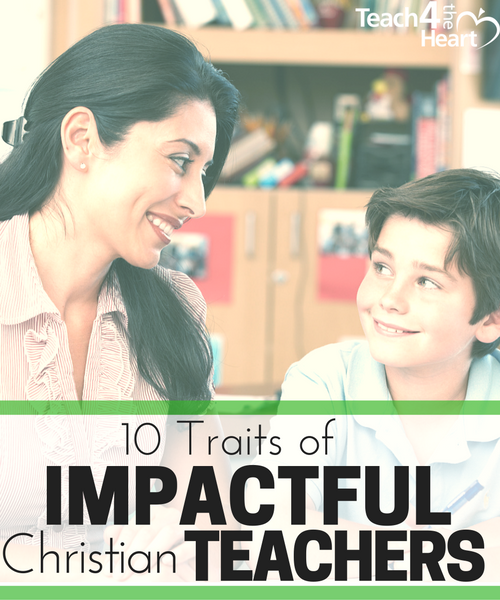 This season we’re discussing 10 traits of impactful Christian teachers – characteristics we need to focus on if we want to go beyond just teaching academics and make a significant impact on our students’ lives. We’re discussing each trait one by one to see what the Bible has to say about it & what it looks day-to-day in the classroom, whether it be in public or private schools. As a Christian teacher, your mission as a teacher needs to go beyond just teaching academics. You need to know God has called you to the classroom, and you should also be looking for Him to change lives, regardless of where you teach. Listen to this episode to find out the different forms this mission takes in public schools vs. Christian schools. 2. Strive for excellence (but not perfectionism). If you want to have a big impact, you need to gain the respect of your students, fellow teachers, and administration. One way to do that is by pursuing excellence in all you do. But while a great danger lies in being mediocre, even greater danger arises when we seek perfection. Instead, we must seek to do our best for Christ, seeking excellence but not perfectionism. In this episode, we discuss in detail the two dangers that attempt to derail our pursuit of excellence. Love is the most powerful force on earth and the one that can make the biggest difference in your students’ hearts. Yet sometimes it’s hard to demonstrate true, genuine love. Especially when a particular kiddo’s not being very lovable. We need to remember that love is not a feeling. Love is a choice. And on the days when love is hardest, we must choose to show love. Listen to this episode to discover 12 ways to show love to your students. We’ve talked a lot about how important classroom management is, but apart from simply keeping order, we have an important question to ask ourselves. Are we more concerned with what’s in a student’s heart or just with their outward behavior? It’s relatively easy to force a certain outward behavior, and students can learn to simply play the part. But what good will that do once they’re out of our classroom. The only way to have a truly lasting impact is to change what’s in their heart. In this episode, you’ll find 7 practical ways you can focus on teaching for the heart. Explore these concepts in more depth with us in Take Heart and Teach. 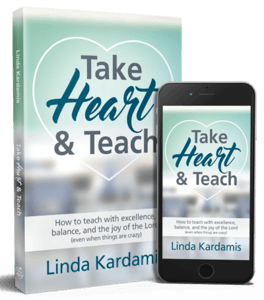 In this easy-to-read book, you’ll discover how to teach with excellence, balance, and the joy of the Lord – even when things are crazy. 5. Be humble & real. Genuine humility and real faith inspire respect in students, which in turn, provides an amazing opportunity for influence. We cannot put on a facade for our students – try to be something we’re not. Instead, we must simply be the best we can, be real about our struggles, and ask for forgiveness when we fall short. But we can’t force humility if it’s not in our hearts. So the first step is to humble ourselves before God in prayer. Listen to this episode to learn 7 keys to displaying genuine humility. 6. Encourage & edify those around us. Encouragement is so much more than praise. It actually means “to make someone more determined, hopeful, or confident.” Are our words and actions making our students more determined to do their best, more hopeful about their own growth, and more confident about what they can accomplish? And do we go beyond encouraging and also edify our students – build up their character as well? In this episode, we discuss specific ways we can encourage and edify both our students and our colleagues. 7. Develop a strong relationship with God. Prayer & our relationship with God are the most important keys to everything in our life, including our work in the classroom. We can teach in our own power, but we’ll only accomplish so much. If we want real, lasting impact, that has to come from Him. He’s the one that knows what our students need. And He’s the one that has to work in their hearts. We all know that a close relationship with God requires spending time reading His Word, praying, and thinking about His truths. But this is more than a ritual. It’s really about asking God questions and listening to Him. About getting to know His voice so that we can hear & distinguish it in our daily lives and follow His leading. This is a life-long process, one that’s never done, but one we should be continually seeking. But as things get busy, it’s easy to let our time with God slide. I’ve found that trying something new (or renewing an old habit) can help refocus my spiritual life. Listen to this episode to discover 15 ways to breathe new life into your time with God. 8. Seek wisdom and truth by thinking Biblically. No matter where you teach, you must always remember that what God tells us in His Word is the truth – regardless of whether it’s popular, regardless of whether anyone else agrees with it. There IS absolute truth. Values are not different than facts. This is the world’s wisdom, but it’s wrong. No matter what situation comes up in your classroom – from girl drama to college advice to a student who comes out to you – if you want to lead students in the right direction, you have to start with a Biblical view of the situation. In this episode, we discuss 3 keys to viewing real-life issues from a Biblical perspective. 9. Trust God and not be afraid. As I read your emails & comments, I see a lot of fear, a lot of stress, a lot of worry. And it’s no wonder – teaching is pretty stressful. But this struggle should look a whole lot different for Christians than it does for non-Christians. And that difference should provide a stark contrast and example – something nonbelieving students and colleagues will notice – something they will want. A Christian’s life should be marked by peace – by trusting God in good times as well as bad, by relying on His strength, and by resting in Him instead of yielding to anxiety. This is way easier said than done, but I think too often we write it off as impossible. Maybe it is on our own, but it’s not with God. Listen to this episode to discover 5 keys to releasing fear & stress and trusting God instead. 10. Evidence the fruit of the Spirit. Imagine the power of your testimony – how attractive the Gospel would appear to your students, parents, & colleagues – if your actions were always full of love, if heart was overflowing with joy, if you had peace amidst the chaos, if you consistently demonstrated patience, if you were kind and good, had great faith, had the humility of meekness, and consistently practiced self-control. Wow! The power of such a testimony! Especially in the classroom! But this is not pie-in-the-sky idealism. This is the life Christ wants from us. These are traits that are essential to the Christian life, qualities we could certainly use an extra dose of in our teaching. But we can’t cultivate them on our own. They are the fruit (the result) of the Spirit and He is the one who will produce them in our lives when we are close to Him, yield our lives to Him, and ask Him to work in us in these areas. In this episode, we discuss 2 false viewpoints that will keep us from cultivating the fruit of the Spirit in our lives and what to do instead. May God work in each of us to develop these traits, so that we can have a significant and lasting impact in our students’ hearts and lives. If you enjoyed these episodes, you can help spread the word by telling your friends & colleagues and by leaving a review of the Podcast. Click here to leave a review on iTunes. Join Teach 4 the Heart. Thanks for all the great work you do. When I’m struggling, like I am this week, I go back to different articles you’ve shared or my classroom management class I purchased & I refocus my thinking. It helps me get up the next day and push through with joy. This is wonderful, Linda! 🙂 I thought I’d have something to add to this but you’ve done a thorough job! May more people hold onto God’s Word as Truth. I speak three languages but since 8 years ago, I’ve prayed that I may ‘think in Scripture’ (as opposed to any of the three languages). I mention it because of the ‘Thinking Biblically’ part of your article. This is possible when we are immersed in His Word, when we are challenged by it and daily seek to live it out. Then as teachers, we can’t help but speak God’s truth into our students’ lives! It’s His Gospel that changes hearts, that’s the impact we want! Hearts following Jesus. The love that God has given me a gift to teach children. I am going to strive to help them build a great foundation in Christ. The thoughts shared above are insightful, deep and thought provoking. Please continue in this good work. Looking forward to more inspiring tips. This is very enlightening. God bless you more. I really felt relieved going through these 10 points for a good christian teacher. Thanks a lot Linda. These teachings are Spirit inspired. Love your passion for Christ and to be a tool in God’s hand in helping the young ones to be who God made them to be from the foundation of the world. Keep being the light in the dark world. God bless you!